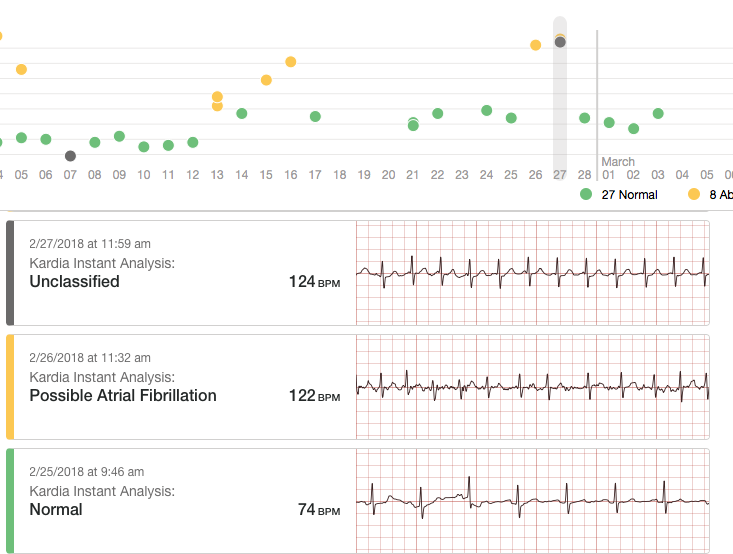 I’m getting a lot of false high heart rate readings with the Kardia app but understand it is the Apple watch that is at fault regardless of the app interpreting the reading (perhaps the watch is confusing electrical current with heart rate since some of my false readings occur when the watch is being recharged). Are these false alarms causing you and other Kardia Pro users difficulties? It is also annoying that the Kardia app does not cause my watch to vibrate when my heart rate is too high so am failing to take ECGs when I should; I am insensitive to high heart rate. The settings on the watch are as high as they will go, and the watch vibrates for other non-health apps. 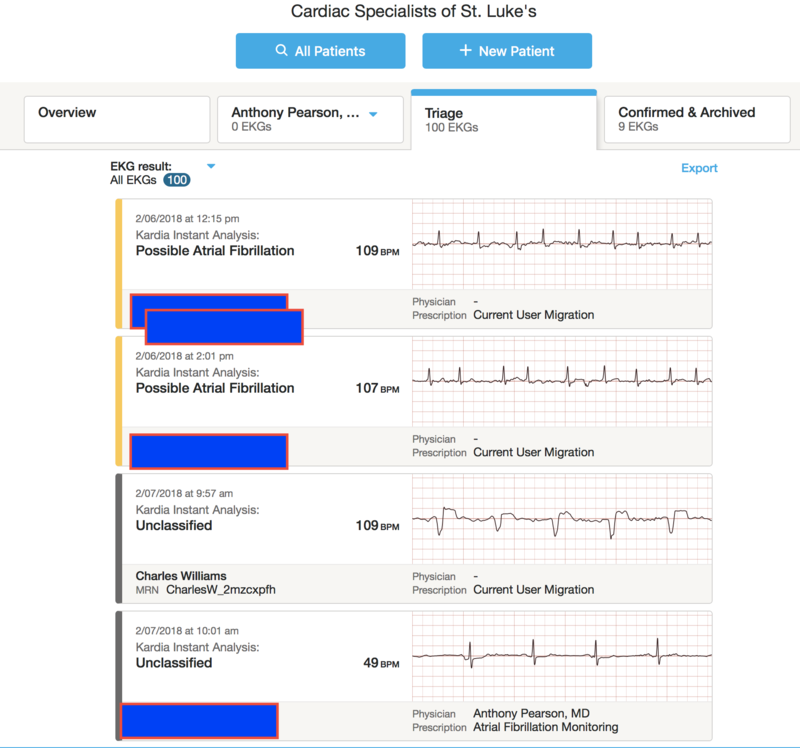 Perhaps you can persuade AliveCor’s techies to upgrade the software. I have been using my AiiveCor for about three years now because of the recommendation from Dr. Pearson. I have a difficult time recognizing when I am in Afib. I have learned when to do a reading now and send it to Dr. Pearson because I have gone into Afib. This device is helping me as well as Dr. Pearson determine my treatment. It has given me peace of mind to know Dr. Pearson can see my reading immediately. Possibly. But I haven’t figured out exactly how. 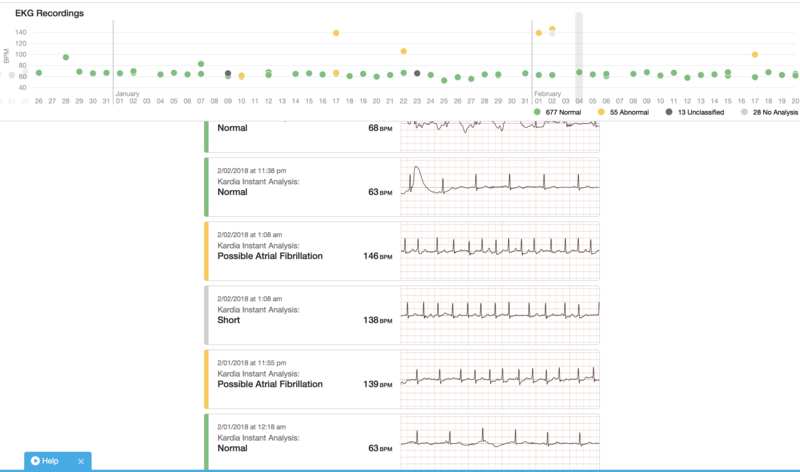 The Kardia/Apple Watch allows exercise/weight/heart data and BP (with Omron devices) to relatively seamlessly gather in an easily scanned format. I don’t see any integration of diet or sleep which are arguably as important as the other data. In your experience, how accurate are the “normal” readings? I’m struggling to get consistent, good quality recordings (low voltage and/or high noise) and I’d like to know if I can more or less trust the algorithm. I’m completely unqualified but I don’t understand how it can differentiate between p wave or random noise etc. 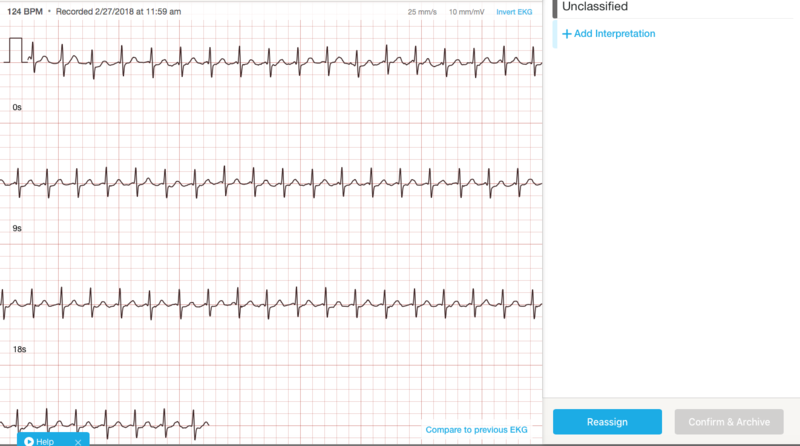 I tried placing the recorder on the left side of my chest, but that mostly comes back as “unclassified” – even when taken a few times in a row, intermittently with multiple “normal” finger ECGs. The chest recordings have high voltage and low noise, but seem to lack detail. I’m in my 20s and use the device hoping to catch the disturbing but probably benign moments of skipped beats and palpitations, not atrial fibrillation. I could send more details via email if that’s of any interest. Normal reading is highly accurate. Have you tried the left knee , right hand , lead II method? I should add that “normal” means no atrial fibrillation and a rate between 60 and 100. So when it says normal you are almost always in normal sinus rhythm but you could still have PVCs or APCs .